Today, Andy and I had the ultimate Mexican breakfast. We had to use steak knives and fork for this breakfast. 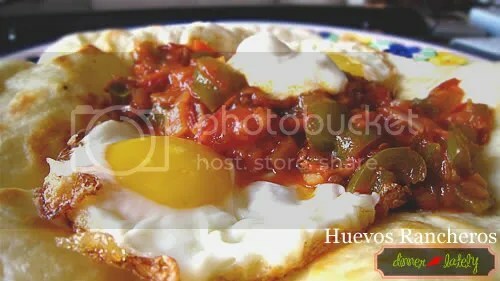 I’ve wanted to try Huevos Rancheros (Ranch Eggs) in Mexico but never got the chance when we were there. Since we have some sour cream, tomatoes and tortillas leftover from the week, I though why not make it myself this time. I found an easy and flexible recipe here, and below is my modified recipe of the cooked salsa sauce. You can make the sauce ahead of time or the night before so that there is less to do in the morning. Just reheat in the microwave or on the stove prior to serving. This is also good salsa to be eaten with tortilla chips when you have company over. You can have guacamole and Spanish rice on the side if you prefer to have only 1 egg and 1 tortilla for your Huevos Rancheros. But for us, I actually sandwiched mozzarella cheese between the stove-top heated tortillas in the microwave prior to placing the eggs and salsa on top to make a fast cheese quesadilla. Sweat the onions in 2tbsp of olive oil in a medium sauce pan or skillet under medium heat. Add garlic and diced peppers and let them cook for about 2 minutes. Stir to avoid them from sticking to the pot or pan. Add in chopped tomatoes and chipotles. Add in some sauce from the can if preferred. Stir and let ingredients cook until soften. The tomatoes should produce enough liquid for the salsa after simmering for a while, otherwise you can add a a tablespoon or two of water. It should take about 30 minutes for all the vegetables to be soft enough. Season with salt to taste. If tomatoes are too acidic, add a pinch of sugar. This entry was posted in Breakfast, Mexican and tagged adobo, Breakfast, chipotle, cooked salsa, huevos rancheros, Mexico, tortilla. Bookmark the permalink. Swooning for that as it’s breakfast time here right now! Oh nice recipe, going to try this one out onight, well… maybe tomorrow. wow, this one looks sooo good, I wanna try it some day!! Leave out the bell peppers – most definitely not traditional, and they take over the flavor of the dish 😦 Best way to get some taste into the sauce is to roast the tomatoes, onions, garlic and chile (if using fresh chiles) on a griddle (skins on) until the are soft, then peel them all, throw them in a blender and puree ’til smooth. Then “fry” the sauce – heat up some oil in a pan, pour the sauce in, and some stock (chicken)- watch out, it will spit! Cook while stirring until the flavors combine – i.e. tastes cooked, not raw. We’ll I know what I’m having for breakfast tomorrow!